The scene sure seems to be weighing in on protests and violence, but with all the subtlety of a brick through a window. Detroit is a game about a subjugated group asserting their humanity and trying to gain freedom from people who want to use them for service. It’s hard not to draw parallels to slavery, racism and events going on around the world. Despite this, however, director David Cage told me that he’s not trying to make a game with an overtly political message, nor is he heavily drawing on real world history or politics as influences. In the demo, Markus and North can answer that question in a number of ways. Their central goal is to break into a store by night and free a bunch of fellow androids, but they’re able to do anything from sneaking and hacking their way inside to driving a goddamn truck through the front door. They can even fail and get the police called on them. The story branches from there, rather than telling you that you failed and forcing you to try again. In the demo I saw, the truck approach ultimately led to the riot. After freeing the androids, Markus gave a rousing speech and encouraged the other androids to help him send a message. They then set to vandalizing an abandoned city square, and a stark, red-and-blue meter appeared on screen. As the player made choices about how to advance the riot—for instance, by choosing to knock down a statue or merely tag it with holographic cyber-graffiti—the meter ticked toward either the red end (violent) or the blue end (passive). The person controlling the demo largely took violence actions, smashing windows, busting doors, and ultimately setting cars on fire. As I mentioned above, North is fully in favor of the conflagration. “Violence is the only language humans understand,” she says at one point. It’s not the most subtle depiction of why people engage in property destruction. When I pointed that out, Cage said that it was just one character’s perspective. He told me the rest of the game is more complicated than that. 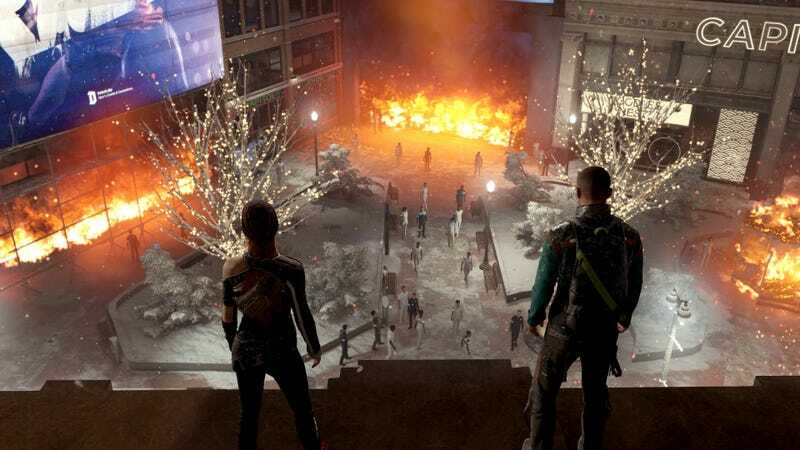 Still, this is the scene Cage and Quantic Dream chose to partially divorce from context and demo at E3, one that shows binary choices despite what they say about the rest of the game. Similarly, Detroit and this scene are relevant to things going on in the world today, whether or not Cage wants them to be. While Cage told me that he’s not trying to make a game with a particular message, he does want people to ask questions of the world around them.